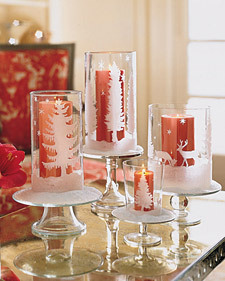 With their motion frozen in clear glass glitter, coniferous trees and reindeer encircle hurricane lamps lighted from within by tall, rose-hued candles. Here, the candleholders are elevated on glass cake stands, then faux snow is dusted around them. Photocopy template, enlarging to fit into a glass hurricane lamp. Roll up the template and slide it inside the glass, with the design facing outward. Secure at the top with transparent tape. Using glue in bottle with a fine-tip applicator, outline one section of the design, then fill it in. Working over a bowl, sprinkle with clear glass glitter. Let glue dry; shake off excess glitter. Glue and glitter the next section of the design. Continue all the way around. Remove template; let dry overnight. Place hurricane lamp on a cake stand, and place candle inside.